In a large bowl, combine butter, confectioners' sugar, egg, almond extract and vanilla extract. beat until smooth. Mix in flour and salt. Roll into 4 inch strips, place on baking sheet. Curve top down to form handle of cane. 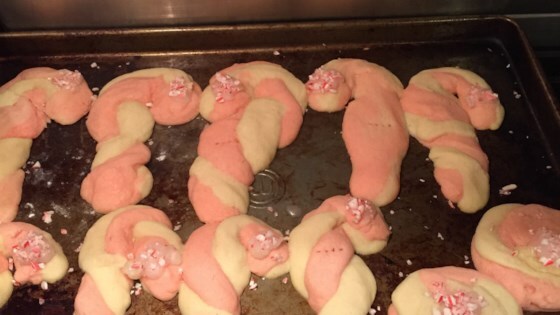 Candy cane-shaped Christmas cookies decorated with crushed peppermint candies. These tasted very good. The only thing I'll do different next time is roll the dough skinnier. They puffed up pretty big. The almond extract gives it a great taste.